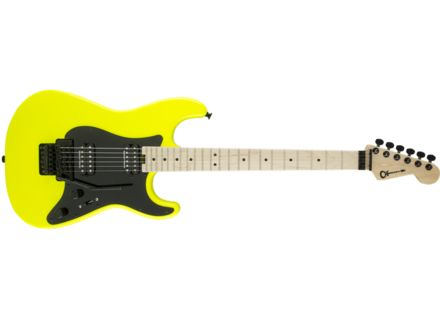 Pro Mod So-Cal Style 1 HH FR, STC-Shaped Guitar from Charvel in the Pro-Mod series. Charvel's new 2016 version of the Pro Mod So-Cal Style 1 HH FR mostly differs from its predecessors with the inclusion of Seymour Duncan TB-6 Distortion (bridge) and Seymour Duncan SH-6N Distortion (neck) pickups, instead of the previous, more classical JB-'59 association. This model is available in 7 different finishes, ranging from the most 80s-reminding colors (Neon Pink, Neon Yellow, Rocket Red, Slime Green) to the more classic and discreet Metallic Black, Snow White or Specific Ocean. MSRP is $1249.99. [NAMM] Ibanez presents Talman Prestige models Ibanez has recently reintroduced the Talman series, which now includes some Prestige models like the TM1730 and TM1730M. [NAMM] Michael Kelly Guitars CC50 Fralin Michael Kelly Guitars has teamed up with pickup builder Lindy Fralin to create the CC50 Fralin guitar.